Call center monitoring by Phoenix and Scottsdale, Arizona based company Sage Advantage can help you improve your call center’s performance. Every call center has a goal to provide first class customer service when people call in. But, it can be difficult to find time to monitor calls, provide training and coaching when needed, and analyze data to ensure things are running smoothly. When you use Sage Advantage for your call center monitoring needs, you get many benefits. Not only will you gain time back in your day, but service will improve and, in turn, so will your sales. But, you may be wondering how Sage Advantage helps you accomplish this. Keep reading to find out. Sage Analytics, our proprietary software, plays a significant role in helping manage your call center monitoring needs. Designed to store a large amount of data, yet be easy to navigate, this software can do it all. From call recording to predictive analytics, you won’t need to use multiple systems each day. Instead, find everything you need in one place, starting you down the path to having a high quality call center. Our software isn’t the only service we offer. 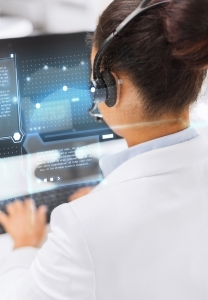 Part of call center monitoring is monitoring your representative’s performances, getting feedback from customers, and providing coaching and training when needed. We can help with all three. Our call recording service makes it easy to pull calls and QA them. When you use Sage Advantage, our experts will review calls and identify high performers as well as areas where improvement is needed. Then, your Quality Manager will discuss these finding with managers and supervisors and provide suggestions for training and coaching. Another part of call center monitoring is getting feedback from customers. After all, how an outside person perceives things isn’t always how the customer perceived it. Our survey products can help you get candid responses to help gauge how the customer felt their interaction with your call center went. This is a great way to get a well rounded picture of your call center is performing. Phoenix and Scottsdale, Arizona based company Sage Advantage is so much more than just a call center monitoring company. Offering a variety of services to help make managing your call center more manageable, we work with you to create a fully customized plan to help you meet your goals. To learn more about call center monitoring with Sage Advantage and its additional company, Evaluate Quality, or to schedule a free demonstration of our software, be sure to contact us today.